What is Invisalign? How does Invisalign work? Is Invisalign right for everyone (me)? So, what exactly is Invisalign? Much as we use the words Kleenex to talk about facial tissue, or Band-Aid when we mean bandage, Invisalign is frequently used to describe what orthodontists call “aligner treatment”. Invisalign is the largest and most well-known company that provides aligners. So, their name has become a generic trademark for all aligner treatments. What is the aligner treatment that Invisalign, Clear Correct, and other companies offer? While aligner treatment may seem complicated, the basic principle of how it works is not. The secret to moving teeth with aligners or braces is just in applying a gentle force continuously. Aligners are really just a thin layer of clear plastic that surrounds the teeth. Aligners are removable. When worn, they are very cosmetic. Most aligner patients report that other people do not know that they have them in. There is usually a series of aligners to be worn. Each is worn for a period of time before switching to the next aligner in the series. Each aligner moves the teeth just a little bit further than the one before. Add up a little movement from one aligner, a little more from the next, and a little more still from each of the next ones, and you can come up with quite a bit of movement that they can achieve. What are the positive things about Invisalign aligner treatment that our patients tell us? The most common positive feedback that we hear from patients is that they are thrilled to finally be able to have their smile improved and their problems corrected without having to wear braces. Most other people do not know that they are wearing aligners. Also, they can take them out for special occasions. All of these can be important factors for patients who want the healthy beautiful smile that orthodontics can provide, yet they prefer not to wear braces or they are unable to. Do patients express concerns about Invisalign aligner treatment? In order to work properly, aligners should be worn full time except when eating, drinking anything other than pure water, or brushing your teeth. Practically speaking that means that they should be worn 20 to 22 hours per day. Of course, they may be left out for weddings, graduations, or other special occasions. That is part of their appeal. For some patients, these requirements are easily handled. For others, having to remove the aligners to eat, drink a soft drink, or take a sip of coffee is more of a challenge. Some even elect cosmetic braces as an alternative. These are factors to consider when making your decision. Is Invisalign aligner treatment right for everyone? If you listen to the companies selling aligners, the answer seems to always be yes. In our strong opinion, a truthful answer is a bit longer and a bit different. We believe that it can be a very good treatment for some patients and not as good a treatment for others. 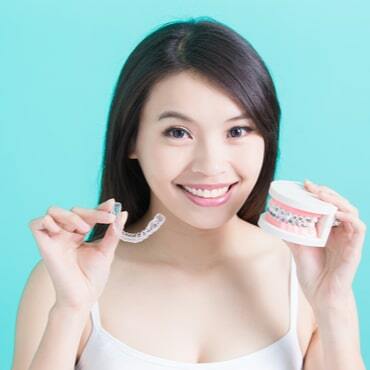 There are some movements that aligners do quite efficiently. There are other movements that they are not efficient at. In an ideal situation, all of a patients’ needs and wants can be addressed with aligner treatment. In a less ideal situation, sometimes the patient may elect certain compromises in order to be able to be treated with aligners. Finally, there are some patients for whom aligner treatment should not be recommended. Our goal is to provide the best possible treatment for our patients. This includes listening to their goals and concerns, doing a thorough evaluation, and then helping them to determine what is the best treatment option or options for them. Sometimes that is Invisalign aligner treatment. Sometimes it may be other options. So which patients is Invisalign aligner treatment good for? Is it good for me? Patients with nearly all types of malocclusions can be candidates for Invisalign aligner treatment. Patients who have crowding, spacing, excess overjet or overbite, openbite, underbite, and crossbite have all been successfully treated with Invisalign aligner treatment. Likewise, specific situations within these malocclusions can cause aligner treatment to be less desirable or even not recommended. The solution is to have an evaluation and consultation with an orthodontist. This should be someone whom you trust to listen to your goals and concerns, who will thoroughly evaluate your situation, and who is willing to discuss the advantages and disadvantages of all your treatment options with you. If you would like to read more about Invisalign aligner treatment, please click here. If you wold like to read what the American Association of orthodontists (AAO) says about treatment options, please click here. If you would like a complimentary orthodontic consultation with Dr. Robert Kazmierski to see if you are a candidate for Invisalign aligner treatment please click here or call us at (856)727-0177 to schedule an appointment.